The third and final part of an ancient obelisk looted by Italy nearly 70 years ago has been returned to Ethiopia. 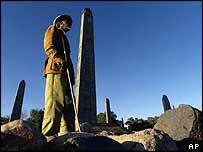 The Axum obelisk is regarded as a national treasure by Ethiopians and thousands turned out to celebrate the return of the last piece. On Monday, Prime Minister Meles Zenawi said the monument, due to re-erected in September, was a "symbol of identity". Italian troops took it to Rome in 1937, where it stayed despite a 1947 UN agreement for its return. The final, bottom section of the 1,700 year-old monument arrived in Axum early on Monday. The middle piece had been sent last Tuesday and the top on Friday. 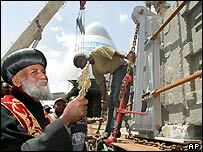 "It is not merely a piece of stone, this is a symbol of identity," Mr Meles said, as he boarded the plane to inspect the cargo. "It is the end of a very bad chapter," he added. The ornate 24-metre (78ft) obelisk is regarded as an outstanding example of architecture from the ancient city of Axum, itself seen as one of the four great kingdoms of the ancient world. It stood for years outside the United Nations Food and Agriculture Organisation in Rome, despite an Italian commitment to send it back to Ethiopia. It was eventually dismantled by Italian experts in 2004 in readiness for its journey home. The operation is costing Italy an estimated 6m euros ($7.7m). But the obelisk's return had been beset by "technical difficulties" and repeatedly postponed. The 160-ton monument had to be broken into three pieces. Many Ethiopians see the obelisk as a vital national symbol, and the prospect of its return stirs strong emotions. Lattanzi, the Italian company responsible for transporting the obelisk to Axum, has described the obelisk as the largest, heaviest object ever transported by air. The airstrip at Axum had to be upgraded to handle the vast Antonov-124 aircraft - one of only two planes large enough to carry it. In addition, a radar was installed. Who should own historic artefacts?